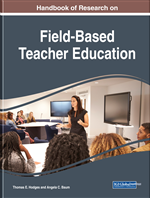 The goal of this chapter was to explore the impact of a field-centric, grade-band, and subject-area specific field experience model that is linked to corresponding coursework on novice teacher candidates' conceptions of what it means to be a teacher. Grounded in the work of scholars such as Dewey, Piaget, and Vygotsky, this study explores three questions: What aspects of the Adopt-an-Apprentice program do teacher candidates view as beneficial to their understanding of the profession and their development as teachers? What benefits, if any, do classroom teachers derive from hosting teacher candidates in the Adopt-an-Apprentice program? What is the impact of grade band/subject-area field experiences on teacher candidates' conceptions of being a teacher? Using quantitative and qualitative surveys, the study illustrates how coursework linked to authentic application in clinical settings empowered novice teacher candidates to understand and engage content, pedagogy, and standards. The means by which teacher candidates learn to teach has been the subject of exploration by numerous researchers in the past three decades. While research from the 1980s and 1990s demonstrated that teacher candidates spent most of their time in campus classrooms absorbing knowledge about teaching, with a single, final semester of applied teaching (Huling, 1998), research by the late 1990s spotlighted successful programs that featured systematic, long-term collaboration (Wideen, Mayer-Smith, & Moon, 1998). Since then, calls for improved teacher preparation through early, frequent, varied, and purposeful field experiences in authentic school settings have multiplied (Boyd, Grossman, Lankford, Loeb, & Wyckoff, 2009; Cochran-Smith & Zeichner, 2005; Coffey, 2010; Zeichner, 2010). Darling-Hammond (2010) has long argued that the clinical side of teacher education is frequently “haphazard” and “dependent on the idiosyncrasies of loosely selected placements with little guidance about what happens in them and little connection to university work” (p. 40). In addition, Zeichner (2010) argued that the lack of meaningful partnership between colleges of education and K-12 schools signified the core problem in teacher education. In short, research consistently cites strong partnerships between universities and schools, along with coursework examining teacher practice, as a hallmark of quality education programs (Ball & Forzani, 2011; Cochran-Smith, Villegas, Abrams, Chavez-Moreno, Mills & Stern, 2015; Coffey, 2010; Darling-Hammond, Chung, & Farlow, 2002; Wilson, Floden, & Ferrini-Mundy, 2001).